It’s not easy for me, a proud Wisconsin Badger, to admit but Ohio State vs. Michigan is the biggest rivalry in college football. There. I said it. Don’t believe me? In a 2003 espn.com fan poll, “The Game” was voted the #1 college football rivalry (beating out Army/Navy, Auburn/Alabama and Texas/Oklahoma for those keeping score at home). Referring to my last post, Ohio State is winning big this year, both on the field, with the #3 ranked team in the country, and off the field with their Zero-Waste program. Michigan, on the other hand, has been trailing on both counts. With their home loss this past weekend to Nebraska they are no longer in the running to be Big Ten Champs. Losers of 9 of the last 11 vs. Ohio State, Michigan’s green sports program has fallen behind their rivals as well. But, with an emerging Green Game Plan that’s broader than that of the Buckeyes, things are starting to turn around. Paul Dunlop, the facilities manager for Michigan Athletics, broke down each element of their game plan for me. Michigan is very proud to hold the title of the largest football stadium in the country, but does it take pride in being a large producer of waste because of that? I doubt it. That is why the athletic department has made recycling and waste reduction a priority. 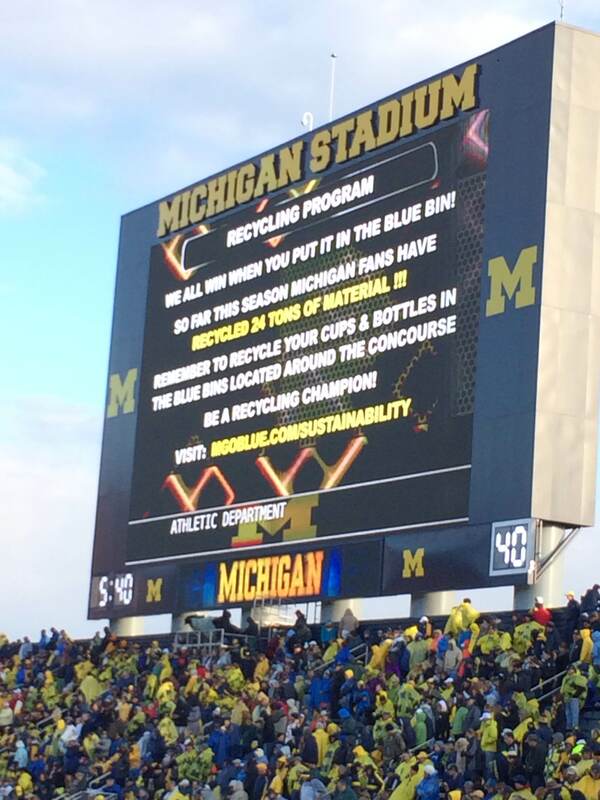 “We All Win When We Put It In The Blue Bin” PA announcements and signage let Wolverines fans know that recycling is important. As a result, Michigan football diverted 40.8% of waste, equaling about 485,000 lbs. from the landfill in 2012. Those numbers should go up some since they started composting their Back-Of-(Big)-House food preparation operations this season. If Michigan wants to take things to the Ohio State level by doubling those diversion rates and thus managing large-scale, zero-waste events, they need to bring composting to the Front-Of-House, with clearly marked composting bins. Using compostable food and drink materials, provided by concessionaire Sodexo. There is no current timetable for when the Big House will become Zero-Waste, but fans, student-athletes, and others the university are beginning to demand it. That Ohio State’s Horseshoe has already achieved Zero-Waste status for some games will certainly push Michigan. One thing is for certain: Making the Big House not only the largest stadium in the country, but also the largest zero-waste stadium will be a Big Deal. As big as The Big House is, it’s only one part of the Athletic Department’s physical footprint. And that footprint will be getting bigger as sixteen new facility projects and upgrades (including renovations of the swimming & diving, track & field, volleyball, wrestling, softball and soccer venues) are on the drawing board with total construction costs currently estimated at $160 million. The Michigan Green Game Plan takes sustainability into account on a project-by-project basis. Dunlop mentioned that most projects will at least reach LEED’s minimum construction standards, but they will not seek LEED certification in all cases because of the fees involved. Crisler Center, home of Michigan basketball, received LEED Gold Certification this past summer for its renovation and expansion project. Energy efficiency through building automation is another top priority, with particular emphasis placed on lighting control systems. These systems aim to eliminate unnecessary energy consumption through occupancy censors. In addition, Michigan is currently installing LED lighting in their tennis facility, partnering with Sustainable Solutions, an Illinois-based LED lighting solutions distributor. 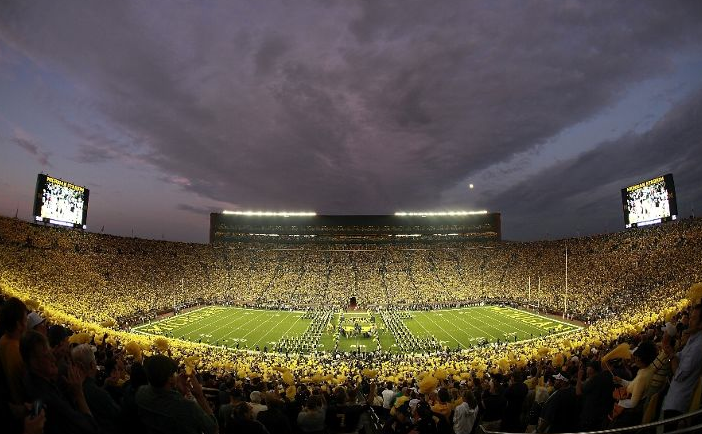 Speaking of lighting, The Big House didn’t have permanent stadium lights until the 2011 football season. The new energy efficient lights are augmented by a state-of-the art, anti-reflective glass product from Michigan-based Guardian Industries. Anti-reflective glass lenses surrounds the lighting fixtures, maximizing efficiency and enhancing illumination. Automated irrigation systems have been installed to reduce unnecessary water consumption. 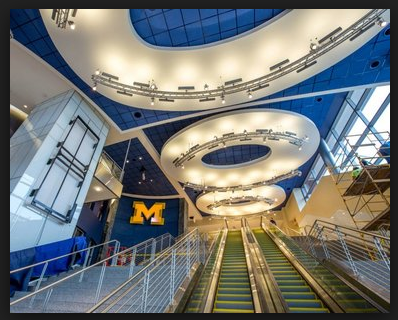 The LEED Gold Crisler Center features low-flow plumbing fixtures including showerheads and waterless urinals, which have the potential to save a lot of water. An Erosion and Sedimentation Control Plan is reducing contamination caused by construction pollution from soil erosion, waterway sedimentation and airborne dust generation. Finally, Michigan is working closely with their custodial team to use less water when cleaning and to create a better working environment that is safe from harmful chemicals. Engaging fans and student-athletes in being greener off the field will magnify the Maize & Blue’s successes on the field. Fans have easy access to Michigan’s Green game plan by visiting their webpage (http://www.mgoblue.com/sustainability). There, they will learn how they can play a key part in Michigan’s greening, Zero-Waste efforts. Student-athletes are getting in the green game through Michigan Student Athletes for Sustainability (MSAS), founded by sustainability-minded former soccer player Courtney Mercier. In my eyes, this group is the most impressive aspect of the Michigan Green Game Plan, because student-athletes are the reason college athletics exists. When these role models become passionate about creating a sustainable environment, fans will become more passionate. A common thread of this post is that Michigan athletics does things in a big way. Former MSAS advisor and current Erb Institute for Global Sustainable Enterprises graduate student Leah Zimmerman played an important role in growing the Michigan Athletic Department’s Green Game Plan. Leah sat on an Athletic Department-wide committee (involving marketing, operations, communications, IT, etc.) whose mission is to follow through with and scale up the Michigan Green Game Plan and, in so doing, build the campus-wide conversation about sustainability. Michigan is the only athletic department I have come across thus far that has such a dedicated, multi-disciplinary committee. While much of the Michigan Green Game Plan is still to be implemented, its comprehensive nature is something that, if successful, others in the Big 10—and beyond—should consider modeling. I recommend that all of the Big 10 Athletic Departments collaborate on sharing green best practices—and adopt a conference-wide Green Game Plan. Now, THAT would be really BIG–because everyone wins when sustainability becomes a priority.